The social studies component of our Middle School is where students develop their understanding of the pluralistic nature of our country, our place in history and the meaning of democracy. They develop a more global perspective and gain an appreciation of human rights. We strive to enable our students to understand the complexity of modern society by examining the geographic, religious and cultural pillars which have shaped the past. The course of study for the fifth grade presents the story of the development of the United States beginning with a brief history of pre-Columbian settlements through the remarkable development of the United States until the 1850’s. Sixth grade students explore ancient world history concentrating on regions of the Middle East. In seventh grade, students focus on many topics in European history including the Middle Ages and the Renaissance. The curriculum also examines developing countries in Asia and Africa. Eighth graders study the seminal events which have shaped our own country – Colonial America, Great War of Independence, Westward Movement, Civil War, Industrialization, Immigration and the drafting of significant documents including the Declaration of Independence and our Constitution. 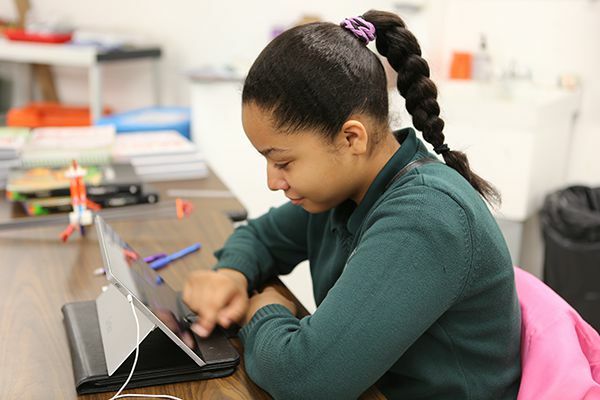 A hallmark of our Middle School is the close collaboration among faculty members where interdisciplinary planning and block scheduling result in a vastly enriched experience for all middle school students. As students learn the history of ancient Greece and Rome, they also write their own myths, comparing them to contemporary portrayals in current fiction such as the Percy Jackson series. Students also learn the Greek Alphabet, Roman Numerals, study astronomy and contemplate the architecture and art of the times. They also make connections to today’s world by reading about current events, articles and editorials, factual accounts and personal histories. Research projects in social studies require the application of skills taught in English Language Arts.